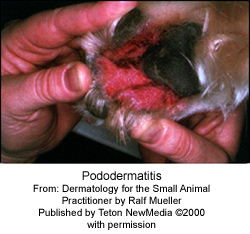 Pododermatitis is a term used to describe inflammation of the feet or paws. Pododermatitis is an inflammation that can be caused by many disorders including infections, allergies, hormonal disorders, immune-mediated diseases, tumors or cancers and environmental contaminants. What is the general environment in which the dog walks and lives? Is there is seasonality to the clinical signs or do the symptoms last year-round? Are there additional lesions elsewhere on the body? What, if any, has the response to other treatments been? What is the dog's diet? Has the dog traveled anywhere outside its usual environment? Does the dog have any other medical problems? What are the clinical signs of pododermatitis? Infectious - The feet and paws are often red and swollen. There may be nodules or fungal lesions (kerions), ulcers, or discharge (pus) from the lesions. There is often hair loss and the dog may lick the feet constantly. Allergic - The feet are red and inflamed, and swelling is usually present. Itching is a constant problem with the tops of the paws most commonly involved. There is usually reddish brown staining of the fur from pigments naturally present in the saliva. In cases of contact pododermatitis (walking on or contacting an offensive substance), the undersides of the paws are usually involved, although the entire paw may be affected. Immune-mediated - The most common clinical signs are crusts (scabs) and ulcerations with occasional blisters. All four feet are commonly involved, especially the footpads and nailbeds. Excessive darkening of the tissues and thickened, crusty footpads with erosive lesions may be present, especially in cases of pemphigus foliaceus. Hormonal or metabolic - Lesions are usually caused by secondary skin infections and include pustules, redness and inflammation. Tumors - Usually only one foot is involved and there may be a nodule, or one or more ulcers. Multiple feet may be involved in squamous cell carcinoma of the nailbed. Environmental - One or more feet may be involved, depending on the cause or contact status. Most dogs experience chronic interdigital inflammation, ulceration, abscesses and discharge with or without itching. How is the specific cause of pododermatitis diagnosed? Diagnosis is based on medical history and clinical signs. 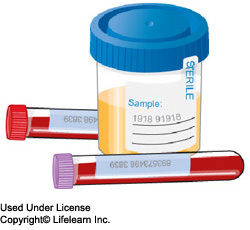 Additional tests including bacterial culture and antibiotic sensitivity tests, fungal cultures, skin scrapings, biopsies, blood and urine tests, hypoallergenic food trials and radiographs may be performed based on your pet's specific needs. Tumors of the foot are more common in cats than dogs. As you can see, there are numerous potential causes for your dog's condition. "Once a specific diagnosis is made, treatment will be directed toward that cause." Once a specific diagnosis is made, treatment will be directed toward that cause. If the pododermatitis has an allergic or immune-mediated cause, it is important to note that the condition will not be cured. In these cases, the therapeutic goal is to minimize clinical signs and recurrences. What is the prognosis for pododermatitis? The prognosis is dependent on the diagnosis. Most dogs respond well to therapy. With simple lifestyle adjustments, they go on to enjoy relatively normal lives.